Banderas is an EPD Top 1%er! His stats are excellent overall, but his EPD in staple length soars. Did you read Ian Watt's article in Alpacas Magazine? YES, length matters! To that end, we are still using this oldie but goodie to cover our females with shorter staple length. His latest cria was born on 6/17/18. Catalina has produced phenomenal offspring, including National Brown Color Champion, Sweet Pines Torino! 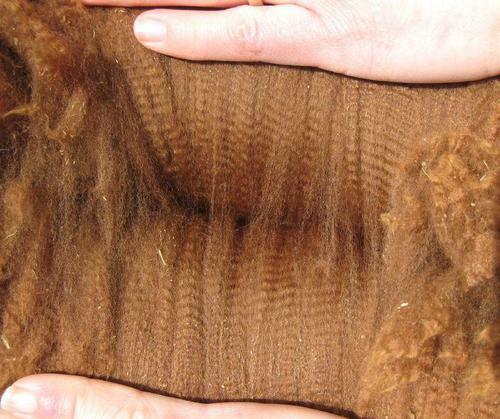 Catalina's fleece is an exquisite medium brown with a SOFT handle and tight, consistent crimp. She has straight conformation and a perfect bite. 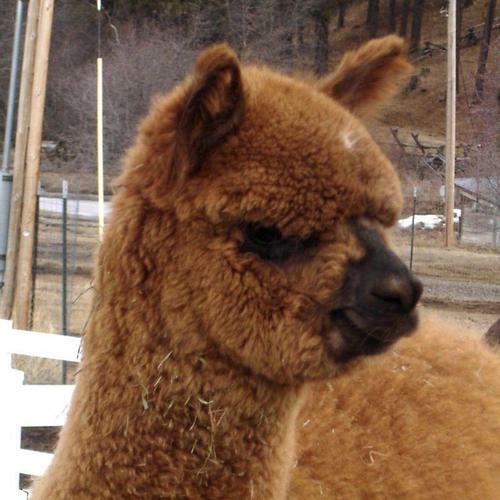 She is one of those friendly, confident alpacas that catches your attention right away. And then when you start looking at her pedigree, you know you can't go wrong...especially if you are breeding for superior QUALITY COLOR. Torino is a National Champion, winning 1st & Brown COLOR CHAMPION with his fleece at the 2011 AOBA NATIONALS and also at 2012 GWAS. He has also won 3 RESERVE CHAMPIONSHIPS, 2 of them for halter and one for fleece at the Level IV AFCNA Continental Fleece Show with 19 out of 20 for fineness and handle. Judge Wade Gease commented: "Exceptional fineness with hand, crimp, and density. What more could you ask for?" 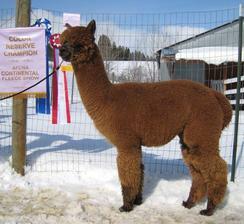 Likewise, at the 2010 International Alpaca Odyssey, Judge Ruth Elvestad commented on his finenesss and conformational correctness, placing him as Dark Reserve Champion. While at the IAO, we took advantage of the tremendous opportunity to have international judge Dr. Julio Sumar evaluate Torino. To our delight, Dr. Sumar scored Torino very high, giving him full points in many different categories. Our thoughts on this boy have been confirmed in a big way! There isn't just one thing we love about Torino - we love everything. His comformation is compact, square, straight, and strong. His head is perfect. 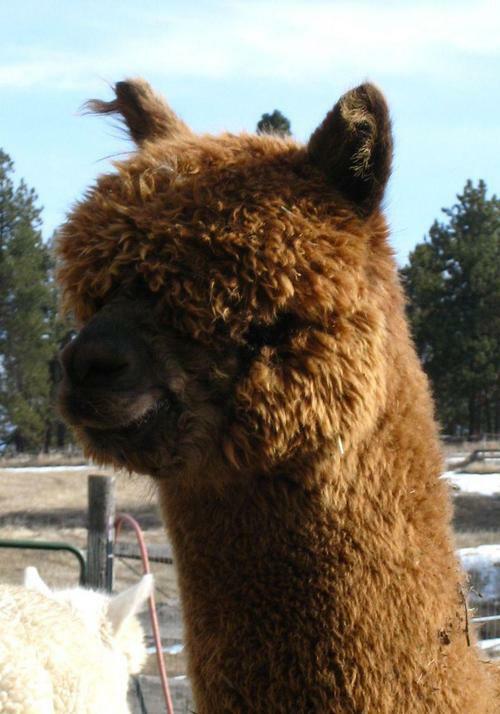 His fleece is exquisite - DENSE, CRIMPY throughout, UNIFORM, fantastic handle, and amazing length! Torino is the best alpaca born on our farm. Torino's pedigree is excellent. Sire's side - VICTOR, PLURO, Sir Winston of Melbourne, Mountain Gold. Dam's side - LEGACY, EL MOUSTACHIO, AUGUSTO, Don Julio. His sire, Spanish Peaks Banderas (PERUVIAN VICTOR grandson) is a champion dark rose grey, producing very dark rose greys (base color bay black) along with solid black, brown, and fawn. Torino's dam has a consistently nice handling medium brown fleece, strong conformation and 4PERUVIAN LEGACY for her grandsire. His granddam is a fawn champion who consistently produces show worthy offspring. Torino is an excellent choice for any breeding program looking to decrease microns & increase uniformity with superior density & character. What more could you ask for?